Can you believe it’s the last trading day of the week?! We’re checkin’ out ranges and triangles on the Swiss franc’s charts today. Check it and see if you can get pips off of them! A couple of weeks ago we saw CHF/JPY plummet from its 114.00 December highs to the 106.25 area. 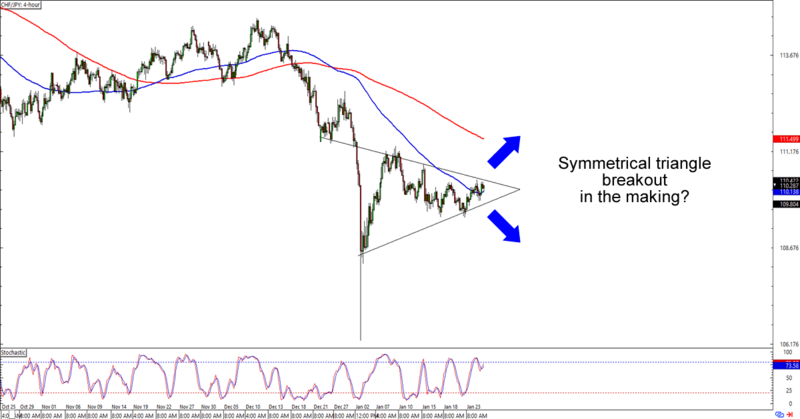 The pair has taken a chill pill since then, but now it looks like the Swiss franc is gearing up for a breakout against the yen. I’m talkin’ about the symmetrical triangle on the 4-hour chart, yo! The School of Pipsology tells us that triangles like these tend to break in either direction though they can sometimes serve as continuation signals. So, which way will the franc go? Will the bears extend their rally and drag it back below 108.00? Or will the bulls maintain their pace all the way to the 112.00 – 114.00 previous resistance areas? The triangle is about to run out of real estate, so y’all better whip up your trading plans if you’re planning to trade a breakout on either direction! Here’s a nice and simple range play for ya! 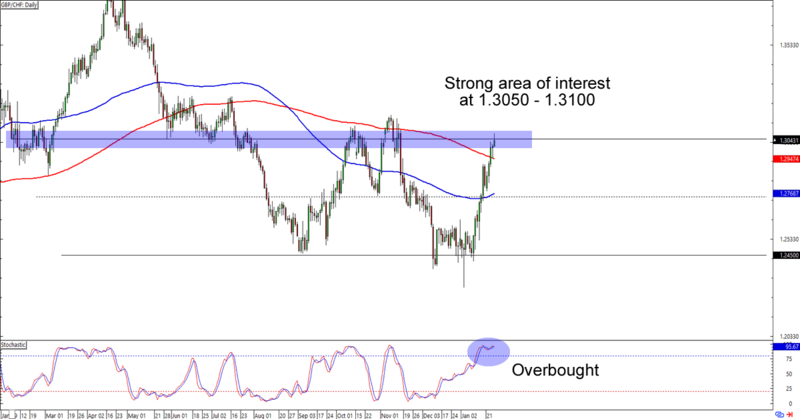 GBP/CHF just hit the 1.3000 – 1.3050 levels, which is riiight at the area of interest that has been serving as support and resistance since early last year. With stochastic hitting overbought status, you can bet your pips (with proper risk management, of course) that other bears are already looking at this setup. Think the pound will lose pips against the franc? A short trade at the earliest signs of bearish momentum would give you a good reward-to-risk ratio especially if you target the range support near 1.2450. Just make sure to use wide stops, aight? Currency crosses usually see more volatility than the majors, so y’all better not use tight stops just to get more pips!